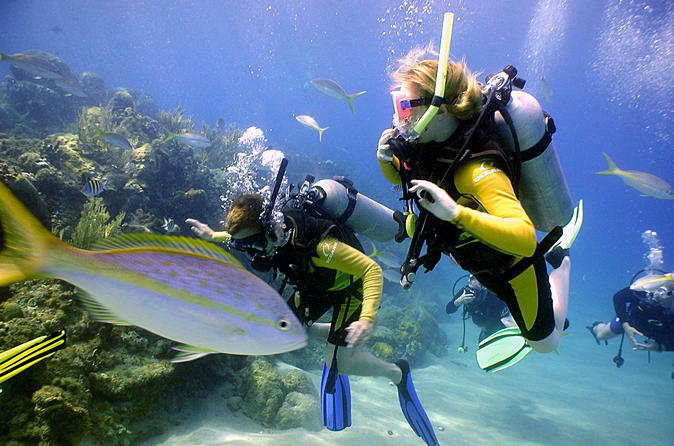 Complete a PADI Discover Scuba course during your stay in Puerto Aventuras. This 5-hour course allows you to resort dive with the dive company during the entirety of your stay. Flexible course times to fit your schedule. Make your way to Dressel Divers Puerto Aventuras base, Barcelo Maya Colonial Hotel at your chosen course time. Multiple course times are available to fit your schedule. The 5-hour course consists of one theory session, one pool session, and one open water dive to a maximum depth of 40 feet/12 meters. The Discover Scuba Diving program allows you to learn the sport of scuba under the close supervision of a professional dive staff.